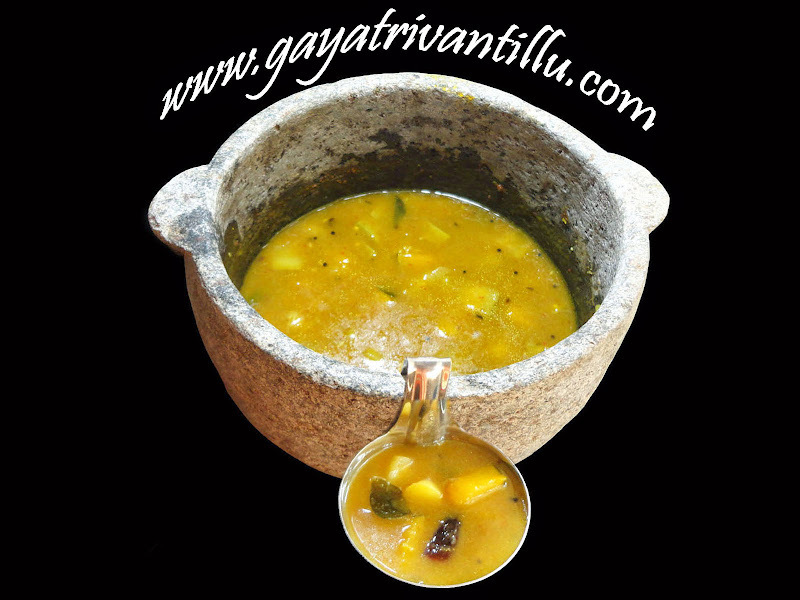 Pulusu is an Andhra variation of Sambar prepared in Tamilnadu. Generally all Pulusu's have tamarind pulp in them, which reacts with the vessels (except in stainless steel) in which they are prepared. Before stainless steel was invented cooking vessels were mostly cast in various types of alloys such as brass or bronze and these alloys reacted with the tamarind in Pulusus (forming a green rust which is called as KILUMU in Telugu). Thus our elders needed an inert material to prepare these pulusus. In Telugu Rati (Stone) + Chippa (Vessel) = Rachippa. The Rachippas or stone vessels are carved out of soft stone and they served as an inert material to cook recipes like pulusus, which had tamarind. Traditional families have these Rachihppas stacked on their attics and must have forgotten also. I could chance upon one such stone vessel which probably is as old as my mother-in-law's, mother-in-law's, mother-in-law's. If this is true, it must be more than 100 years old!!! We hear many stories when our elders narrate how the preparations made by their elders were so tasty because of the vessels they used. At times these narrations border with myths and childhood imaginations. However, the fact remains that preparations in stone vessels take longer time to cook on a charcoal stove and the recipe simmers for long time. This gives ample time for the various ingredients like, salt, tamarind, chiili hotness, jagerry sweetness etc to cross with each other and seep into the vegetables body. A rachippa also retains heat for a longer time, thus even when fire is turned off the pulusu in rachippa continues to simmer and brings out the flavor from the vegetables.Thus these recipes naturally taste great!!! Wash and cut bottle gourd into medium sized pieces---if the skin is tender no need to peel it. Wash pumpkin and remove the seeds portion and cut into pieces along with the skin. Wash and peel sweet potatoes and cut into medium sized pieces. Wash green chilies and slit them vertically keeping it intact. Break red chilies into pieces. Wash tamarind and add 50ml water to it and cook on high flame till water starts boiling. Lower the flame and cover the bowl and cook tamarind for 2 minutes. Cool and extract smooth pulp adding extra 50ml water. Place the rachippa on flame and add water into it. Add the bottle gourd pieces, pumpkin pieces and sweet potato pieces and slit green chilies into the rachippa and cook on medium flame till water starts boiling. Once water is boiling, lower the flame and cook covered till the vegetables are cooked. Meanwhile prepare a spice powder for pulusu. Heat a pan and add a drop of ghee. Add fenugreek seeds and stir fry for few seconds and add coriander seeds and red chili pieces and fry stirring well. When fenugreek seeds change color to brown giving a nice aroma, switch off the flame and transfer the fried ingredients to a bowl and cool for a while. Powder the fried ingredients using a mortar and pestle. Observe that after 30 minutes vegetables are cooked. Now add the ground powder, salt, tamarind pulp, grated jaggery, turmeric powder to the pulusu and cook covered for 5 minutes. Mix rice flour and water. Increase the flame and add the rice flour mixture to the pulusu and stir till it thickens. Now pulusu is ready for seasoning. Heat a pan and add oil and heat oil. When oil is hot add fenugreek seeds followed by mustard seeds. When mustard seeds crackle add cumin seeds, red chili pieces, curry leaves and asafetida and mix well. Add the seasoning to pulusu and immediately cover with a lid to retain the aroma. After few minutes open the lid and stir well and serve hot with plain dal and plain rice. Cook tamarind with just enough water in a microwave oven till it boils and grind in a mixer grinder to get smooth pulp in a jiffy. The vegetables absorb the flavors of tamarind, jaggery and salt and become tasty. 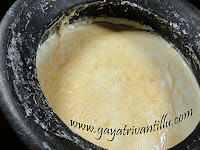 In olden days people used to eat the gravy part of pulusu with dal (mudda Pappu) and eat the vegetables in pulusu (pulusu mukkalu) with curd rice. Now we all have mixer grinders so - no need to make spice powder using mortar and pestle---but using mortar and pestle gives some exercise to our hands and so also a bit of extra taste too which our children can narrate to their children while discussing about us!!! 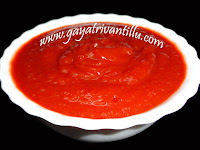 Serve hot pulusu with plain dal and hot steaming rice and enjoy the delicacy.